LES FEMMES - THE TRUTH: Embracing Duty and Honor to Make "Something Beautiful for God"
Embracing Duty and Honor to Make "Something Beautiful for God"
Those lines come from Richard Lovelace's poem, To Lucasta, Going to the Warres (1649) Here's the whole thing, a lovely poem worth the trouble to memorize. Duty and honor go together and, if Hooper is right, doing one's duty represents a key truth that does, in fact, create, in the words of Mother Teresa, "Something beautiful for God." The call to do one's duty is a significant part of the Fatima message. Our Lady called for sacrifice when she appeared to the shepherd children in 1917; and in 1946, Our Lord appeared to Sr. Lucy and told here what pleased Him most. "The sacrifice that each one can make is to do his duty and obey my law. That is the form of penance I now demand." The Church emphasizes our obligation to faithfully perform the duties of our state in life, and St. Joseph is a perfect model for us. He embraced his role as foster father of Christ. What is my duty? 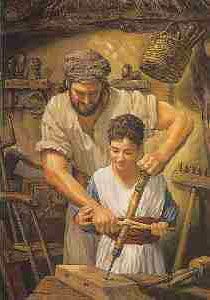 As a child of God, a wife, mother, and grandmother, my duties are different from those of a cloistered nun. I please God in a way uniquely linked to my family duties: to love and support my children and grandchildren, pass on the faith, give good example, etc. I honor God the more I faithfully perform my duties. And one duty we all share is the duty of suffering. We are, I think, most like Jesus and Mary when we suffer. And what an honor to share in the passion of Christ. But how hard it is to say yes to that pain and say (sometimes through gritted teeth), "Thy will, not mine, be done." Sometimes I think about what epitaph would be appropriate on my tombstone. (My kids joke about how long it takes for me to bring up my demise at family functions, but really, shouldn't we all reflect frequently on the four last things? Death, Judgment, Heaven, or Hell?) Anyway, I think an appropriate epitaph would be, "She tried to do her duty." Sometimes I don't do it very well, but I get up every day with the intention to try my best and give my all -- whether it's a thimbleful or a cupful. I wish it could always be an ocean full. What's on your list of duties to fulfill this morning? All the alarms went off and my soul became quiet. Then the spark of Baptisim occurred. That indelible, unextinguishable light.